Where did another month go this fast? I just finished the July-August post and here we go, September is here. In terms of staying vegan, I spent more time with my head down, working and doing research, planning my future steps, therefore had plenty of time to cook for myself. I was eating really well, don´t think I had this many smoothies ever in my life! So I didn´t just eat vegan food like a traveller, but instead I indulged my self in all kinds of curries, pastas, salads, juices and smoothies, even a delicious banana with organic Ecuadorian cocoa, panela and coconut shavings. Yu-u-mmy! This is also down to the fact that I´ve been here longer and I know the foods available to a vegan better, know where I can buy what and can plan my meals better. 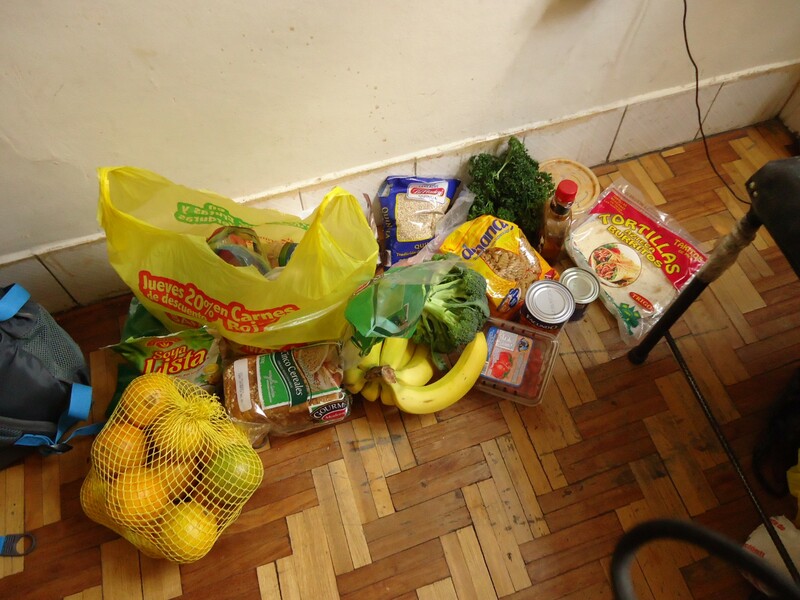 But whoever thinks it´s difficult to travel in Ecuador on a vegan diet – you´re soooo wrong man. With the multitude of fruits and vegetables available, all you need is a bit of imagination and some cooking skills and off you go. My food supply for a few days, good natural healthy yummyness. Because I spend more time working and researching, using internet a lot, I didn´t volunteer in any animal centers. I did a lot of research for Peru, so fingers crossed I can find some that don´t expect you to pay loads of money to work there. Right now I´m playing a waiting game, after sending emails to about 10 organizations. However, I did volunteer on an eco-project, a beautiful cob house construction with a lovely italian family living here in Ecuador. 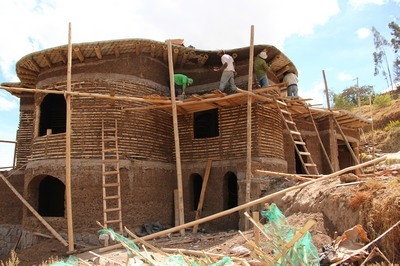 I learned lots about building houses with mud and straw and I also gained new interest and longing to build a house from mud sometime in the future…. a project I´ll mull over the time on this journey and who knows what will happen when I´m back in Slovakia…. I also went to Galapagos, didn´t volunteer there, but I learned lots about how we (humans) impact nature, and how easily can we destroy a habitat. Have a look at my Galapagos isn´t Disneyland post to find out more. In terms of keeping fit, as I mentioned above, I was eating really well and healthy, but I don´t have any scales to actually check whether I gained, sustained or lost weight…. Will check it out as soon as I´m in a place with some type of scales. But I´m pretty sure I gained a bit of weight, as I was eating more, I treated myself by going to restaurants a few times, not really saving on money for food. This is the last place where I should look at saving money! I upped my 100 a day press ups to 150 a day, doing 50 each time, pretty happy with the result and going to continue raising the bar. I am going to get to 200 press ups a day in October. I dropped the ball a bit on doing 100 sit ups a day – only doing every other day, but I´m not too worried about that, as I focus mainly on my arms at the moment. I did less yoga too, but I did more standard stretching, which was needed after the daily 150 press ups! A hidden bonus this month was attending a Temazcal session, to clean your body and soul. Read the Temazcal post to see if it worked! …and there´s that little thing about smoking again. Well, I quit smoking for about two weeks, then started again for another week and a half. But I don´t mind that, as I can switch it on and off now, so that I only smoke at places where it feels right. Then I can let it go if I´m in an environment where smoking doesn´t fit, doesn´t feel right or is unsociable. This isn´t to say that I´ll keep smoking – I´ll keep it like a leisure activity, like the occasional drink, not part of my day to day.